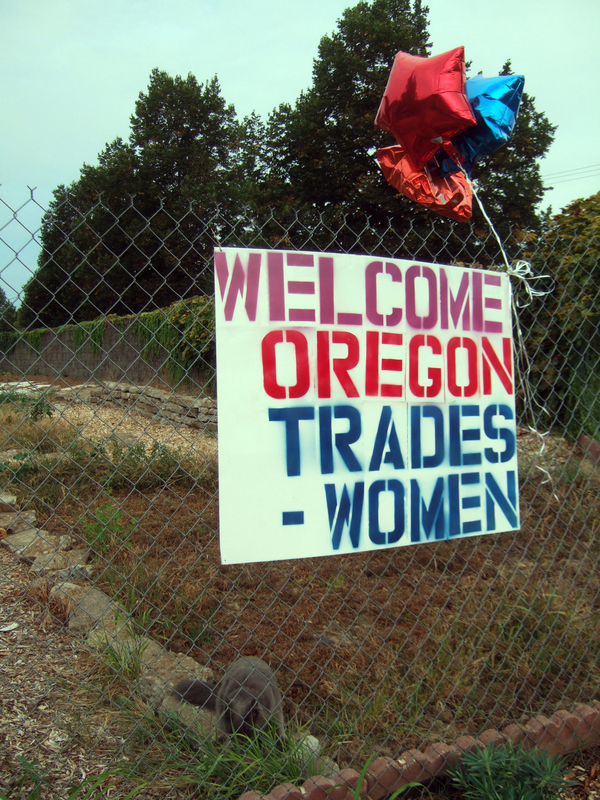 ← Oregon Tradeswomen are coming! It’s been more than a few shakes of a lamb’s tail since I posted last. The main reason is that so much has been happening-and that is a good thing. First, I would like to thank the two Franciscos for their truckload of rich soil. I would also like to thank the “soil fairy” who has, twice, left black trash bags full of really delicious soil in front of the gate. I would REALLY like to discourage donors from leaving things outside the gate since we would want to actually accept the donation (we can give you a tax deductible receipt and we need to be sure we can use the items), but, of course, we can and will use that soil and are super thankful for it! The garden would like to acknowledge some generous donations of lumber, as well. Parr Lumber has given us a discount on our new lumber, The Rebuilding Center is giving us every resource they can, and a personal shopper (thanks so much, Angel!). The best part about the Rebuilding Center is that every employee I have spoken with about this project has thanked ME for doing the project (I kind of want to cry). 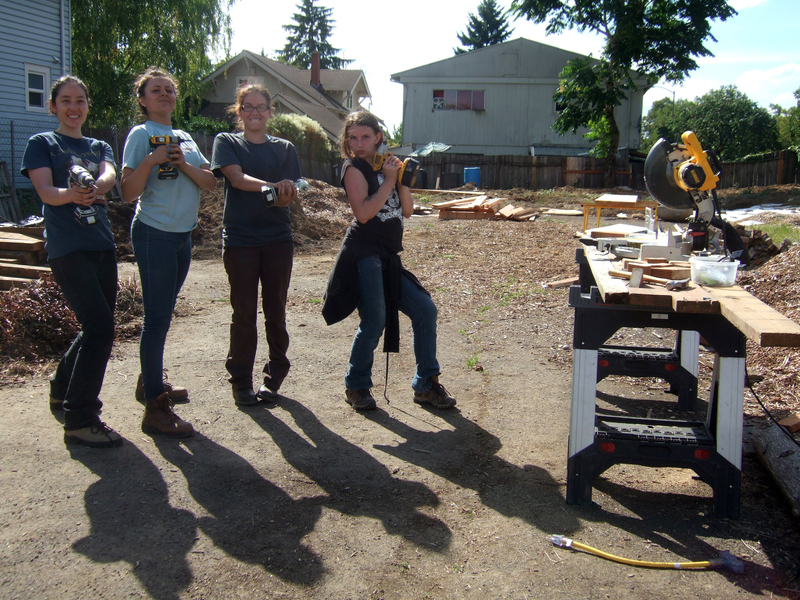 And, now…WELCOME, OREGON TRADESWOMEN! This is an important week for me, personally. I have really been looking forward to meeting this group and seeing them in action. I teach college Art (I’m a sculptor) and some of my proudest moments as a teacher have been spent alongside young women, MIG welders and power tools. I’m convinced that there is nothing better for a woman’s self esteem than a firm grip on a power tool. Foreman Katie runs a tight ship. She’s serious, thoughtful and patient (I hope that’s how I seem to my students) and, though I am not down at the garden all the time (I would just be in the way), my impression is that these are some bright-future’d, hard-working women. I am amazed how much they have done is only 2 days! The shed walls will be going upright when they return next Tuesday! 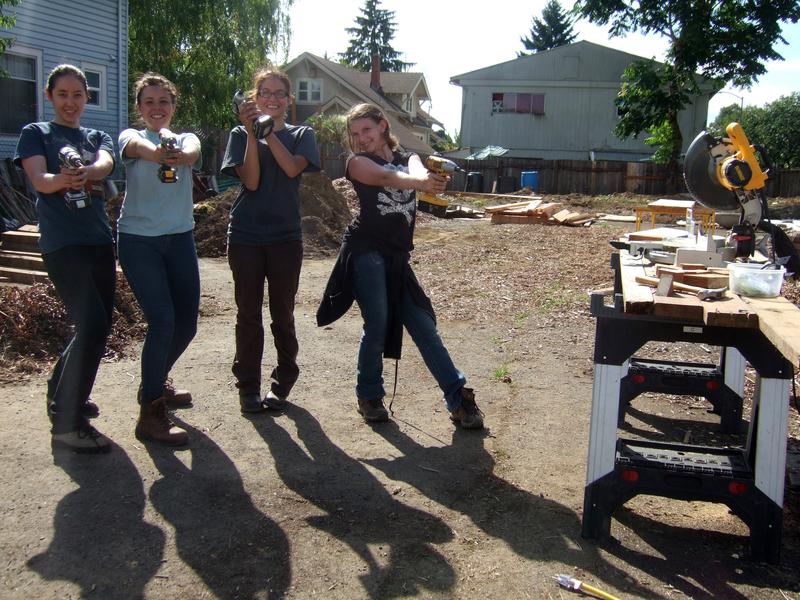 I’m just going to throw this out there- if anyone wants to throw some good old cash at something, Oregon Tradeswomen is seriously underfunded and the grant that brings them to the Foster Powell Community Garden is really only enough to pay for wood! Also, any food establishments that would like to bring them lunch, please just let me know in advance (we’ve probably already sent you a donation request letter). That leads me to the next thing I want to talk about. Before John and I bought our first home 5 years ago, I would not say that either of us really understood the concept of community or cared about it like we do now. Sure we have our family and friends and that is one part of the concept, but starting this garden has opened us both to a new understanding of the term. I was thinking about how much the wood for the shed is costing. We made requests for donations and, while The Rebuilding Center, Treecycle Northwest and Parr Lumber are all coming through with partial donations, the cost is still more than I imagined. As a handy sort of gal, I also imagined how I could have done it on the real cheap. I could have bought a premade aluminum shed that would have done the job. So what’s the trade off? For a little extra money left over I could have (all by myself) got a cheap thing, or made a cheap thing and then we would have a cheap thing that would last for a while. Money and quality aside, it would have been a “me” project instead of a “we” project. Plopping a premade shed in place is not a community effort. Me and my premade shed don’t give these girls an opportunity to learn constructions skills and be proud of their work. Me and my premade shed don’t help promote their organization which is one of the coolest things I have ever heard of. Me and my premade shed don’t allow you to have this experience with us when your read about what is happening in your neighborhood. Me and my premade shed don’t put you in the mood to come and join in or beep and give a thumbs up when you drive by. Also, there is no $400 premade shed that would come close to the quality that is being invested here. It’s going to be a great shed and I think it will come to be a symbol of what this community space means. Having these 6-8 women around my home and on my street, seeing them for lunch and breaks, learning little bits about them and watching them pull off this truly hard work really warms my heart. Most of the young women I meet are either taking my class or related to me-which sets up weird hierarchies about respect. I get to meet these women on common ground and with a common goal, simply, to see our lives improved as a result of our work. It’s at the root of humanity. It’s the meaning of life.